Those who grew up in the 80s and 90s and were active readers in their youth are likely to be familiar with the Choose Your Own Adventure books. This series of novels featured a warning at the start of each book not to read it from cover to cover. The story was broken up into segments, with each part leading up to a choice of a few options. The reader could choose one of the mentioned options and jump to the listed page to continue to story from that option. Part of the challenge was trying to find the best possible adventure from the presented options. Alice Lin clearly has an appreciation for the classic Bantam gamebooks, because she created a cover for a Cabin Choose Your Own Adventure book. Click the image to view the bigger version on Lin's website. Lin's amusing and well done illustration serves the dual-purpose of appealing to my inner geeky child who loved choosing her own adventure, and my love for Whedon and Goddard's movie. 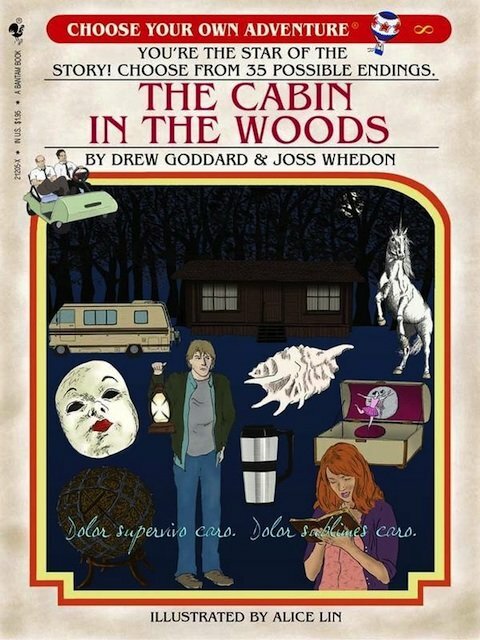 The book cover credits Cabin writers Drew Goddard and Joss Whedon at the top, and includes some of the memorable images from the movie, including my personal favorite - the unicorn. Marty's coffee mug bong also manages to get in there, as does the merman (represented by the conch shell). And the Latin words (that you may be better off not reading aloud) are down at the bottom). If such a book were to actually exist, I can already imagine some of the options, which might include "If you want Dana to read the latin aloud, turn to page 32" and "If you think Marty is right and they should all leave the basement, turn to page 15." Of course, the second option might lead you to the dreaded short paragraph explaining that the story has ended. Then you'd have to try to find your way back to the choices if you didn't think to hold the place with your thumb, so you could make Dana read the Latin. "I'm gonna read a book with pictures. "